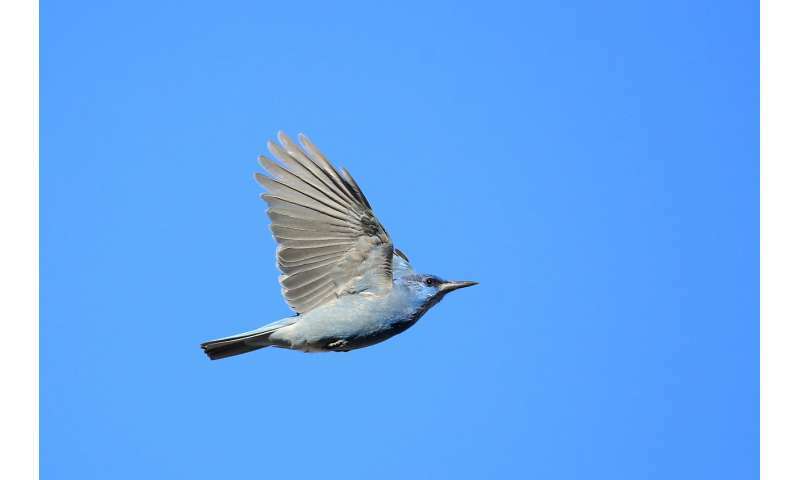 A team of researchers with the University of Nebraska has found that the hormone mesotocin plays a major role in pinyon jay prosociality. In their paper published in the journal Biology Letters, the group describes experiments they conducted with the birds and what they found. Most people have heard of the hormone oxytocin, which has been described as the "love hormone," because past research associates it with the symptoms people report when they fall in love. It has also been found to be involved in sexual responses, including orgasms. Less well known is the part it plays in causing uterine contractions during childbirth and serving as a signal for new mothers to release breast milk. The researchers wondered if the role it plays in human social bonding might hold for other animals. In this case, they studied pinyon jays—a species known to be very social. The slightly bluish birds are related to crows and have been observed to share food, a very clear sign of prosocial behavior. Prior research had shown that many birds (including pinyon jays) produce mesotocin, a hormone that is essentially the same as oxytocin. The researchers wondered if it was responsible for the social behavior exhibited by the birds. To find out, they set up experiments with the birds in cages. Some of the birds received doses of mesotocin and some did not. All were given food while their neighbors were not. The researchers then observed sharing behavior. They report that those birds given doses of the hormone (via intranasal droplets) were more generous than those that did not receive the hormone. This, the team suggests, indicates that the hormone does, indeed, play a role in the prosocial behavior exhibited by the birds. The researchers next plan to investigate the reason behind the natural mesotocin boost in the birds and their prosocial behavior to find out what benefit the birds get from it—they suspect it serves to bond the birds, increasing social connections. Many species exhibit prosocial behaviour, in which one individual's actions benefit another individual, often without an immediate benefit to itself. The neuropeptide oxytocin is an important hormonal mechanism influencing prosociality in mammals, but it is unclear whether the avian homologue mesotocin plays a similar functional role in birds. Here, we experimentally tested prosociality in pinyon jays (Gymnorhinus cyanocephalus), a highly social corvid species that spontaneously shares food with others. First, we measured prosocial preferences in a prosocial choice task with two different pay-off distributions: Prosocial trials delivered food to both the subject and either an empty cage or a partner bird, whereas Altruism trials delivered food only to an empty cage or a partner bird (none to subject). In a second experiment, we examined whether administering mesotocin influenced prosocial preferences. Compared to choices in a control condition, we show that subjects voluntarily delivered food rewards to partners, but only when also receiving food for themselves (Prosocial trials), and administration of high levels of mesotocin increased these behaviours. Thus, in birds, mesotocin seems to play a similar functional role in facilitating prosocial behaviours as oxytocin does in mammals, suggesting an evolutionarily conserved hormonal mechanism for prosociality.